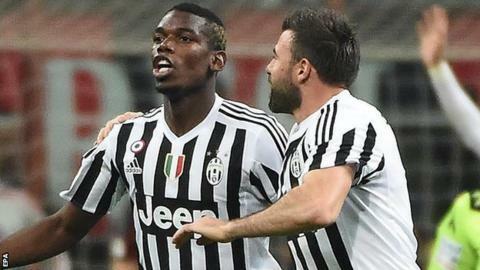 Paul Pogba bundled in a winner as Juventus came from a goal down to extend their Serie A lead to nine points with victory at AC Milan. Alex headed the home side in front from Mario Balotelli's corner. Juve soon equalised, though, as Mario Mandzukic stroked a shot into the corner after receiving Alvaro Morata's perfectly-weighted return pass. Balotelli had a goal ruled out for handball and then Pogba hit the post with a free-kick, before scoring. The France midfielder chested down Claudio Marchisio's corner at the far post and thumped a shot into the ground, with the ball bouncing across goal and in. Balotelli, recalled to Milan's starting line-up, had a mixed night, claiming an assist for his side's goal and testing keeper Gianluigi Buffon with a fine first-half free-kick before being booked. The striker, who was substituted with 13 minutes left, received a yellow card for punching the ball into the net as it dropped loose after Buffon had made a great double save. Milan's defeat leaves them in sixth place, while Juve's lead will be cut back to six points if second-placed Napoli beat bottom club Verona on Sunday. Elsewhere in Serie A, Mauro Icardi's second-half goal ensured Inter Milan moved up to fourth with a 1-0 victory at next-to-bottom Frosinone, who finished with 10 men after defender Leonardo Blanchard was sent off late on. Carpi remain outside the relegation zone only on goal difference after losing 1-0 at Chievo, while Genoa won 1-0 at Sassuolo in the day's other game. Match ends, Milan 1, Juventus 2. Second Half ends, Milan 1, Juventus 2. Juan Cuadrado (Juventus) wins a free kick in the attacking half. Foul by Ignazio Abate (Milan). Luca Antonelli (Milan) wins a free kick in the defensive half. Attempt missed. Kevin-Prince Boateng (Milan) right footed shot from outside the box is high and wide to the right. Alessio Romagnoli (Milan) wins a free kick in the defensive half. Luca Antonelli (Milan) is shown the yellow card for a bad foul. Juan Cuadrado (Juventus) wins a free kick on the right wing. Foul by Luca Antonelli (Milan). Juraj Kucka (Milan) wins a free kick on the right wing. Simone Zaza (Juventus) is shown the yellow card. (Milan) wins a free kick in the defensive half. Claudio Marchisio (Juventus) wins a free kick on the left wing. Substitution, Juventus. Patrice Evra replaces Kwadwo Asamoah because of an injury. Offside, Milan. Juraj Kucka tries a through ball, but Luiz Adriano is caught offside. Kwadwo Asamoah (Juventus) wins a free kick on the left wing. Substitution, Juventus. Juan Cuadrado replaces Stephan Lichtsteiner. Foul by Juraj Kucka (Milan). Offside, Milan. Giacomo Bonaventura tries a through ball, but Luca Antonelli is caught offside. Luiz Adriano (Milan) wins a free kick on the right wing. Substitution, Milan. Kevin-Prince Boateng replaces Mario Balotelli. Substitution, Milan. Luiz Adriano replaces Keisuke Honda. Corner, Milan. Conceded by Leonardo Bonucci. Juraj Kucka (Milan) wins a free kick on the left wing. Keisuke Honda (Milan) wins a free kick in the defensive half. Substitution, Juventus. Simone Zaza replaces Álvaro Morata because of an injury.